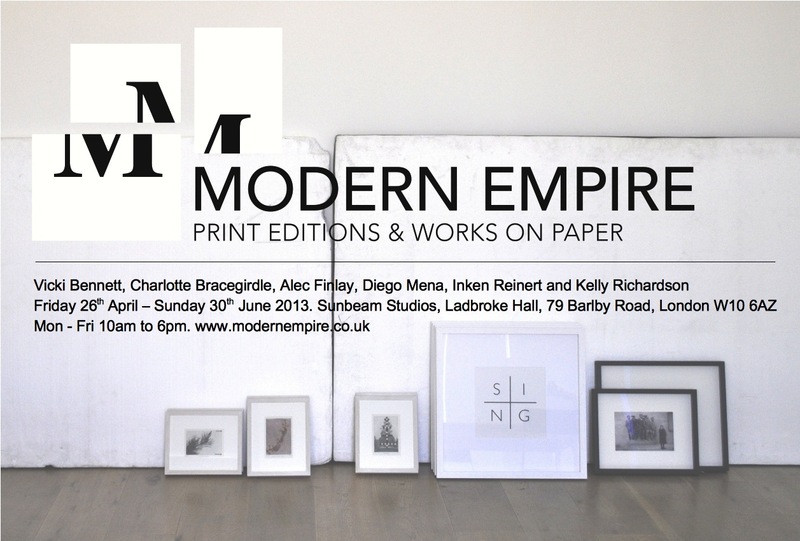 Sunbeam shows presents Modern Empire - Print Editions and Works on Paper, an exhibition including a selection of prints, paintings and collages by some of the artists who have worked with Modern Empire since it began in 2009. Works by Vicki Bennett, Charlotte Bracegirdle, Alec Finlay, Diego Mena, Inken Reinert, and Kelly Richardson. Kelly Richardson's Orion Tide (Edition) I & II is a diptych featuring a desert landscape at night with what appears to be numerous spacecraft or vessels leaving planet earth. Is this space exploration on a grand scale or is this some kind of mass exodus? Richardson often creates ambiguous works that provoke a mixture of contrasting emotions in the viewer. Orion Tide (Edition) I & II could present a number of scenarios – a mass departure from earth, war, or an army of space probes – all of which connote a kind of contemporary sublime, beautiful but equally terrifying. The prints were developed from a large-scale photographic work, Orion Tide, commissioned by National Glass Centre, Sunderland, where it was exhibited in summer 2012. Orion Tide (Edition) I & II are available to purchase either as a diptych or individually. Numbers 1 to 20 from each edition are only sold as a pair. SING/WILD/KIND/WOOD by Alec Finlay is a suite of 4 giclée prints. Each print holds one word, with the four letters from each word laid out in a grid, separated by a central cross. Reworking a line from American poet John Berryman’s Dream Songs, the formal structuring is typical of Finlay's ongoing work with found texts. SING/WILD/KIND/WOOD relates to Finlay's permanent public installation of painted nest-boxes in Victoria Gardens, commissioned by Leeds Art Gallery in 2011. Finlay's work was exhibited at the gallery in the same year, when he was shortlisted for the Northern Art Prize. The work is printed on Hahnemühle Photo Rag by Jack Lowe Studio in a limited edition of 10. Charlotte Bracegirdle’s work is based around the subtle traces that we leave behind. When a person no longer occupies a space everything appears different, but visually nothing is altered. Everything looks, smells and feels as it was when that person was there, but the image is not the same despite evidence telling you that it is. The pictures become empty stages, deserted and uncanny – left only with hints of past activity. Although there are just the empty spaces, surreal shapes and objects floating, at a closer glance you’ll see shadows where once were people. A selection of her works are included; In the Forest, The Falling Soldier, Bench, and A Young Heart. Diego Mena's series of Untitled collages are taken from copies of Vogue Italia. Each collage is made up of multiple layers, with elements from each page removed to reveal parts of the pages beneath. Mena studied History in Spain and Illustration at the London College of Printing, UK. He is establishing a reputation in London and world-wide for his limited edition screen-printed posters, often commissioned directly by bands for distribution at live music concerts. The Modern Empire commissioned prints, Streetwalking and In Retrospect form part of a series of digital collage works included in Vicki Bennett's 2010 exhibition at Vitrine Gallery, London. Bennett uses a unique technique to expand film scenes beyond their conventional screen ratio. The finished results reveal beautiful panoramic views of the background landscapes as captured by the panning camera, effectively allowing film scenes to be seen as never before. Bearing a relation to the British Vorticism movement of the early 20th Century, Bennett takes a Futurist approach to image making, attempting to capture dynamic movement with still images. She often utilises digital technology to apply analogue techniques and for more than a decade has used rotoscoping in her short films and live audio-visual performance to mask, cut and place objects elsewhere on screen. During her commission for The Great North Run Cultural Programme 2009 she developed the process for expanding film outside its frame and began work on this new series of still and moving-image works shortly after. Streetwalking and In Retrospect are available as limited edition C-type prints. They can be purchased separately or as a pair. Inken Reinert's work deals with the heritage of socialist modernism. Her practice, which includes drawings and sculptures as well as collage such as the three Untitled works here, is influenced by her experience of architectural ideology during her upbringing in the former German Democratic Republic. Many of her works take as their starting point illustrations found in books about GDR architecture, before becoming abstracted forms that combine a variety of visual styles from seemingly disparate cultures and eras. Along with her individual art production Reinert is engaged in various collaborative practices including a drawing project together with artists Anke Becker and Nike Hinsberg, or as part of a circle of female artists and cultural workers exchanging their ideas and experiences at a monthly salon.